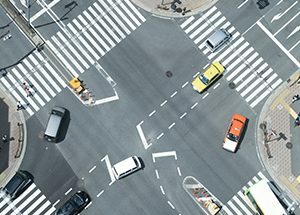 Honda and VW are working separately to make intersections safer. Each company recently announced their developments. Honda is working with the city of Marysville, Ohio to build traffic intersections that work with vehicle-to-x (V2X) sensors in cars. This V2X software communicates between the vehicle and the intersection to warn drivers of anything coming up, which keeps both drivers and pedestrians safe. The hardware display that connects inside the car will receive warnings and give audio or visual alerts to the driver if and when necessary. During this testing stage, the vehicles have a head-up display (HUD). This is a transparent display that presents information onto the windshield, so drivers do not have to look away from the road. Future cars may have the display built into the dashboard. VW teamed up with Siemens in Wolfsburg, Germany to run their smart-intersection program. The program targets ten traffic light signals to communicate their light phases with vehicles. If it works correctly, the intersections will communicate when a “green wave” or succession of green lights is coming up. The result is that a vehicle can coast without stopping. This will improve efficiency on the road and reduce traffic. Similar to Honda, VW’s smart intersection will also alert vehicles of cyclists and pedestrians on the road. These intersections will be able to communicate in a 1,500-foot range and Volkswagen has already announced that their Euro-spec cars will have this technology as a standard starting in 2019.